Is it possible for kids to learn to appreciate classical music? How does one learn to enjoy such complex compositions of music? And what about hymns…and folk songs…? Questions like these may leave some of us thinking that teaching music appreciation to kids is a daunting task at best, especially when we may not have a background in such music appreciation ourselves. Listening without analyzing at first provides the opportunity to become familiar with and start to enjoy the style of a particular composer. Vivaldi taught music in an orphanage for girls. Handel’s father wanted him to become a lawyer. Beethoven composed music even after he became deaf. Mozart wrote his first piece of music at age 5, and composed his first opera at age 12. Chopin, Schubert, and Mozart each died when they were only in their 30s. And of course we also learn the pieces of music each composer is famous for: Vivaldi’s The Four Seasons; Bach’s Brandenburg Concertos; Handel’s Messiah; and Mozart’s opera, The Magic Flute among others. We listen to these stories and music 15 minutes each week until we’ve heard the whole story. At the end of each listening session, the kids take turns giving a narration of what they remember. It usually takes us 6 weeks or so to get through one of these CDs. 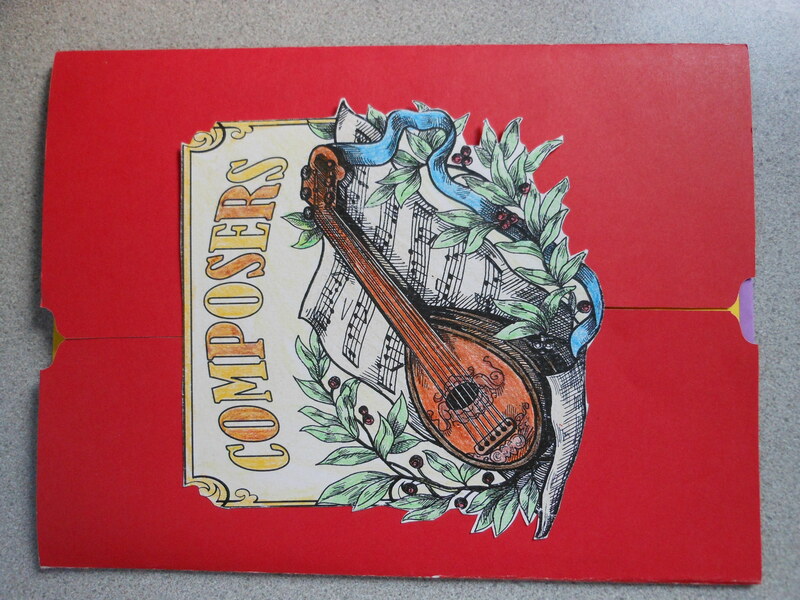 Then on subsequent weeks the kids get out their lapbooks and write a little about the composer in a booklet, and paste it on to a page right along with all the other composers we’ve learned about. They also fill out a page describing a famous piece of music from that composer. They include some facts about the piece, and then they get to draw whatever they imagine as they listen to that piece of music. We study just one composer during each 12 week term, which allows us to get to know three composers a year. Spending this much time with one composer gives us a chance to become familiar with his particular style. In addition to classical music, we also enjoy learning hymns and folksongs. The kids have a “hymn of the month” in Sunday School, where they learn the music and a little of the background. That hymn then becomes the one we find ourselves singing (or humming, or whistling) here at home as well. 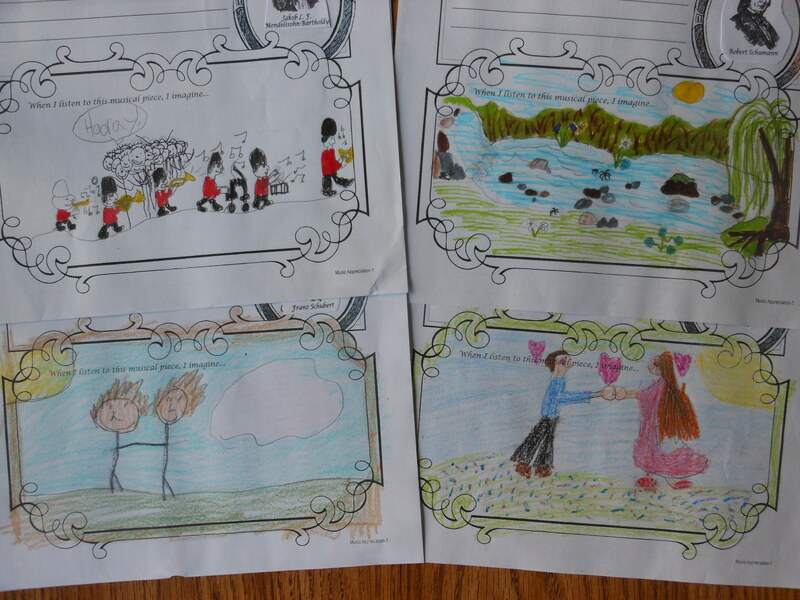 For learning folksongs, we follow Ambleside Online’s recommendations and schedule. A link to the song on YouTube is usually included with the schedule. We’ve become familiar with such songs as Waltzing Matilda, My Grandfather’s Clock, The Lion Sleeps Tonight, and Botany Bay. We’ve also learned some of the background behind the songs — why and when they were written — which usually gives us a better appreciation for the song itself. The lapbooks are available at Homeschool in the Woods. The cds I referenced and more like them are available at amazon.com. Really helpful. And your links are great. My kids go to a Charlotte Mason inspired Christian school in Cambridge UK so helpful to carry it through to the summer holidays. Love what you’ve done! We’ve been reading about the orchestra and opera recently too. It’s wonderful to see my daughter swaying to classical pieces. Who says classical music is boring?! Me too! I’m enjoying learning right along with the kids, though. 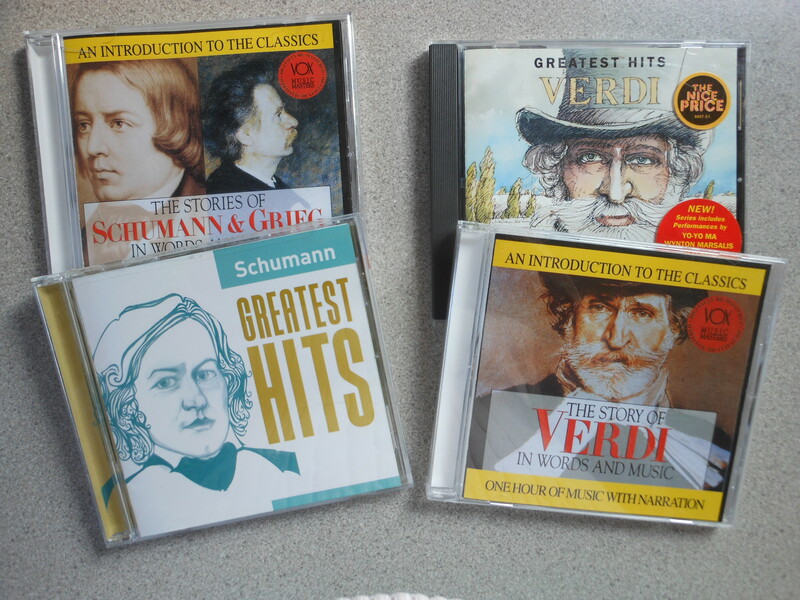 As a professional musician, I am beyond grateful that you endeavor to teach your children about the Great Composers. Thank you. Sadly, today’s music students are not being taught the who and why behind the music they are learning to play. Secular schools certainly do not want their students to learn that Bach wrote INJ – for In the Name of Jesus – above his own name, on every piece of music he wrote. Sigh. . . Interesting note about Bach! I find the lives of the composers to be fascinating and inspiring. I have a book entitled “The Spiritual Lives of the Great Composers,” which I have read to the kids as well as listening to the story on CD. Thanks for commenting. You have a wonderful approach to music appreciation. I love music. Can’t go a day without it, whether that is listening, singing or playing. Thanks for the visit and the like of my post “It’s Apple Blossom Time”.